Unrolling a unique patio rug can fully transform your outdoor space, adding color and texture to your patio, deck, or porch. These outdoor rugs can be perfect for tying together an outdoor seating or dining area, giving the area the ambiance and elegance that they need. They can also be great additions to any mudroom, laundry area, or even your kitchen. It can be quite the challenge to find a rug that will suit all of your individual needs and the needs of your space; what size should you go with? What material is right for you? What pattern or texture should you go with? These are all questions to consider when shopping for your new outdoor rug. Because there are so many options, we have compiled a list of the ten best options for your next outdoor rug purchase in order to help you make an informed, confident decision to tie together your outdoor space. Finding the right outdoor rug for your space can be a daunting task. It may seem that any old rug will do the trick, but there can be quite a lot to consider when choosing the right outdoor rug. Rugs specifically made for outdoor spaces are designed with the weather in mind; they can withstand most instances of inclement weather and stand up to harsh sun and any moisture. They come in a variety of shapes, sizes, materials, and quality. They can withstand dirt, grime, and oil. Striking the balance between durability and aesthetics can be tricky, but this list can help you do just that. 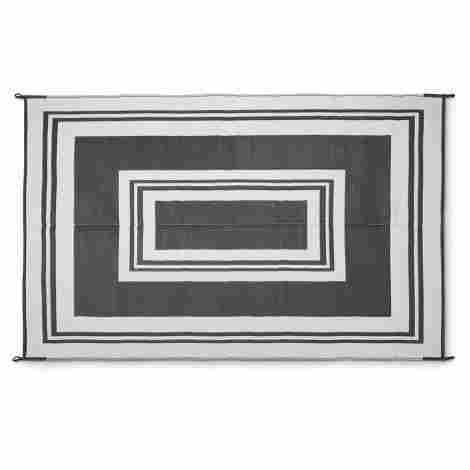 This patio rug is the perfect addition to any patio or outdoor space. The synthetic design is easy to clean and dries quickly, so say goodbye to the days of mold or mildew attaching themselves to your outdoor rug. Available in two colors, the rug can add a great pop of color to your space or tie together a seating area with a neutral palette. Lightweight and easy to transport and store, this mat would be a great addition when camping or staying in an RV. The Reversible Mats Outdoor Patio Mat is great for almost any outdoor scenario because of its material. Because it is made from a synthetic, polypropylene material, this mat is soft enough to be comfortable on bare feet and breathable enough that is will not damage any grass beneath it. Due to the synthetic material, this product can also be cleaned with ease. A quick sweep will remove all dirt and a fast hose down will remove dirt that is harder to remove. It is also resistant to the growth of mold or mildew. This rug can be used in either an indoor or outdoor scenario, used on grass, pavement, sand, or other terrain, and can be easily transported between any of these scenarios. This rug is great for on-the-go or travelling situations. In order to accommodate you, this mat also comes with a convenient carrying case. This mat is one of the best values on the market right now. It has consistently ranked as a #1 bestseller for many online markets and has been applauded for its quality as well as its value. For the quality of the product, the price makes it a relative bargain. The Green Decor Outdoor Rug is a great addition to an eco-friendly patio! Available in many colors and sizes, this durable rug adds a pop of personality to any space -- indoor and outdoor alike. This rug can provide a great spot for an outdoor picnic or time at the beach. 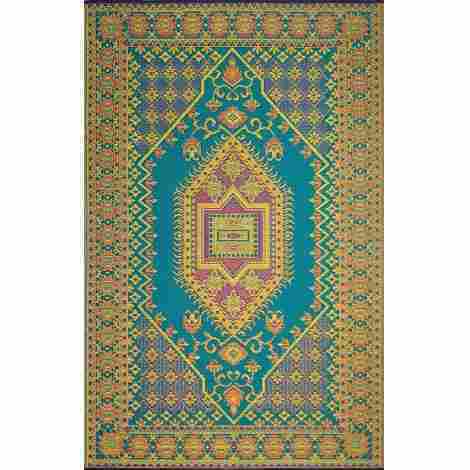 This rug comes in a staggering array of fun colors and patterns, as well as in a variety of sizes to suit any need. Even if your rug is going to spend a few weeks on a beach for your vacation, do not worry! This rug is protected from UV so you do not have to worry about those colors fading. This rug is made from recycled forms of plastic, so you can get all of the great aspects of an outdoor rug without any detriment to the ecosystem. If you care about living sustainably, this rug would be great for you. The company as a whole also focuses on staying green and being sustainable. Because this rug is produced ethically and with recycled and sustainable materials, it comes with a higher price point. However, when factoring in how environmentally friendly it is, you cannot really fault it for that. This unique rug may boast the most fun pattern on the list. Turkish-inspired patterns are flaunted on this rug by Mad Mats, but do not let looks fool you; this rug is made from synthetic materials, making it easy to care for and maintain while also being durable enough to withstand the outside elements. This Turkish rug design will add a layer of interest to your outdoor space that you may have previously thought impossible. Because the synthetic fibers are woven like traditional rug fibers, this rug is able to mimic the patterns of a traditional interior rug. Additionally, this Mad Mats rug comes with a color warranty of one year, so you do not have to worry about any fading. Though beautiful, these rugs are not dainty. Mad Mats rugs are strong enough to stand up to any outdoor weather conditions and are able to fare through any season with ease. They also breathe, so mildew does not have a chance to grow and they will not cause your deck to rot beneath them. 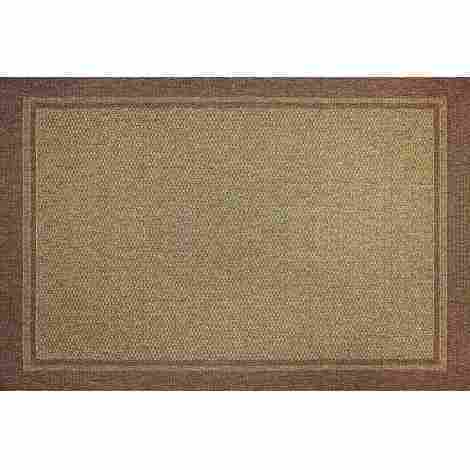 This rug is made from similar green methods to the previous Green Decor rug and, as such, it is priced similarly. However, if you find the pattern to be too much to resist, then you will likely find that this is a competitive price. This fun rug is available in a striking pattern of stripes, but it does showcase a great feature: reversibility! 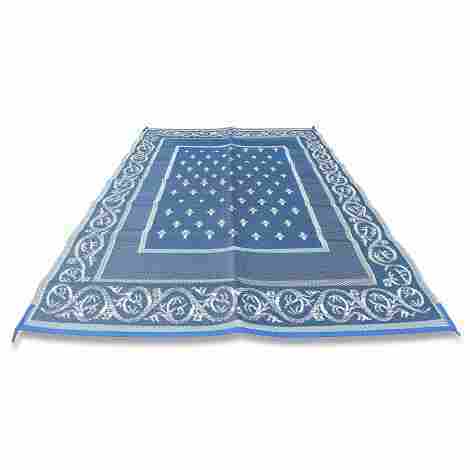 This synthetic rug is durable and can be flipped to easily hide any mess, making a great addition to a child’s room as well as any outdoor space. It also folds easily to promote easy travel. This rug can truly withstand anything! The Balajees USA outdoor rug is made from synthetic materials, promoting easy cleanup and durability in any climate. This rug also is protected against UV rays so those fun colors will not fade. It can also be easily wiped or hosed down. 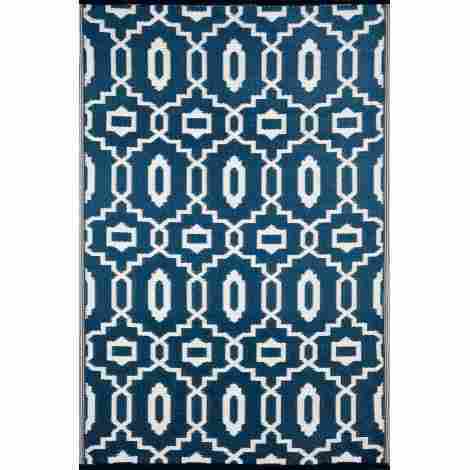 This rug would make a great addition to any outdoor space, adding a pop of color and personality. However, those bright colors coupled with durability make it a great option for a child’s room as well, protecting your carpet from any possible mess. This rug is a very affordable option, coming in close to the Reversible Mats option, making it highly competitive. For this price, you could carpet your home with these and still have money leftover to put them on your patio. This option is a great value for the size of the rug you will get. This is one of the largest rugs on the list, coming it at six feet by nine feet. While this rug was designed with the camper in mind, it would also work extremely well on a patio, beneath an outdoor dining set, or in your backyard for a picnic. This is one of the most affordable options on the list, making it ideal if you are looking for a rug that you will not use often or that you want to take out camping for rough-and-tumble outings. It is a bestseller of outdoor rugs for a reason! This rug would be a perfect addition to a patio space because of its neutral, simple lattice pattern, but it would also fare well as a campsite because of its durability and ability to stand up to weather, traffic, and prevent slipping. This rug is great for the bargain hunter. There is little risk involved when buying this rug, and because it has so many options for use, it is easy to get your money’s worth from it within just a few uses. This beautiful rug has all the decorative qualities of natural sisal rugs, but without all of the shedding and hassle of natural fibers. Made from synthetic material, this rug is durable and has one of the longest lifespans on this list. It can add intrigue to any outdoor space! This rug was truly made to last. It is made from a synthetic polypropylene fiber, making it ideal for any area that gets a lot of inclement weather. 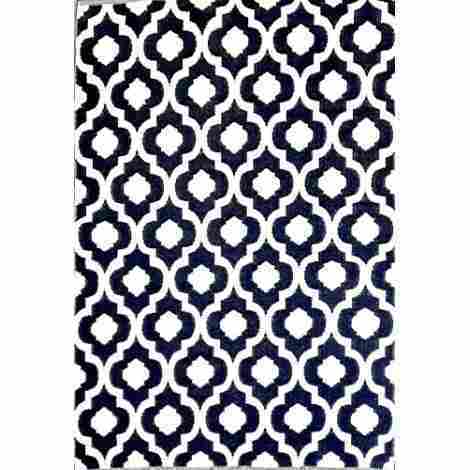 Additionally, this rug would be a great option for any indoor or outdoor space that gets a lot of traffic. This runner can fool the best of them; look quickly and it could be made of jute or hemp, but look closer and you will note that it does not shed, nor is it susceptible to staining. It is all the best things about natural fibers without any of the headache! This rug comes in at the middle of the list, running a pretty standard price. However, it is also available in a runner option, which would be more affordable than the larger, five by seven feet option. All in all, a value! As far as beauty is concerned, this rug has is covered. Available in a variety of fun patterns as well as in more simple designs, there really is something for everyone. 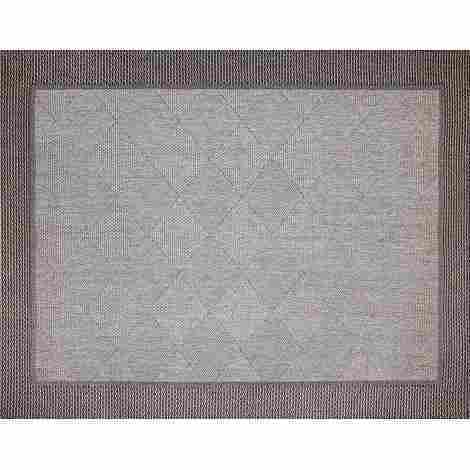 Constructed from synthetic fibers in a strong weave pattern, this rug pairs durability with aesthetics. The synthetic fibers in this rug allow it to stand up to even the harshest outdoor conditions without sacrificing style. The yarn resists fading, staining, and are easy to maintain. They also call to mind the appearance of natural fibers. 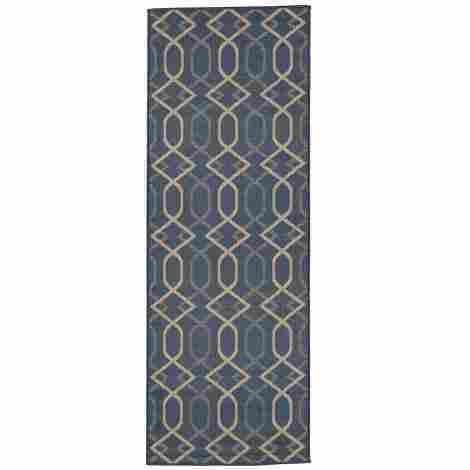 This rug is elegant and sophisticated, no matter which pattern you choose to purchase. Any of these can tie together an outdoor space, adding a nice, stylish element to your sitting or dining area. This rug is one of the pricer options on this list. However, the quality and craftsmanship that goes into each rug is unparalleled, so one might argue that the price point is appropriate. If you are looking for an outdoor rug that is perfect for camping, look no further. This rug is fully reversible, perfect for grass, non-absorbent, stain resistant, and comes with a carrying bag and stakes. This rug and camping are a match made in heaven! This rug was designed with camping in mind. It comes with stakes to keep it tethered to the ground and with a carrying bag for portability. 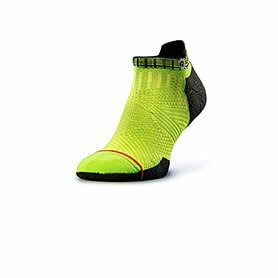 It is slip resistant and holds up to rain with ease. It is lightweight, making it ideal for travel. Made from synthetic fibers, this rug is resistant to mold, mildew, staining, and fading. It is easy to clean and maintain. The synthetic fibers are non-absorbent, so water will flow right through it. It dries quickly, making cleanup less of a headache. 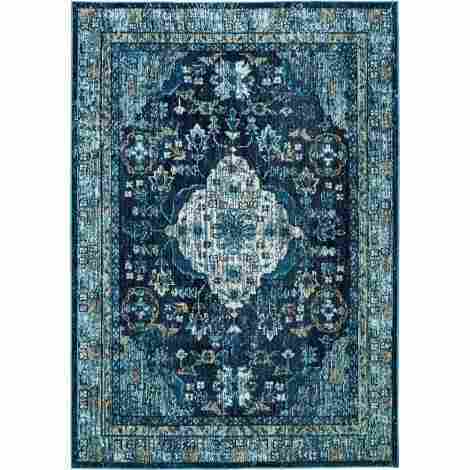 When you factor in the stakes and carrying bag, this rug runs close to the middle of the price range of this list. Additionally, while this was designed for camping scenarios, it lends itself to gardens, beaches, and other uses as well. If your space demands the utmost in taste and style, this rug has what you are looking for. 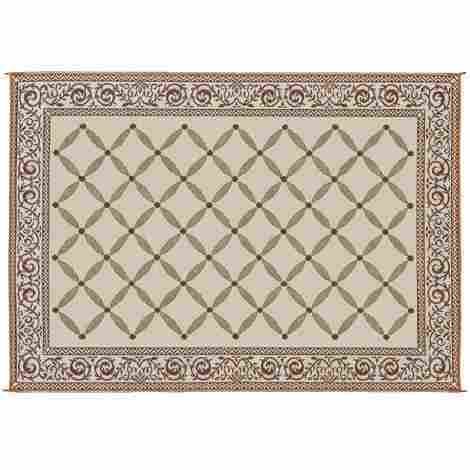 The elegant patterns are available in three different sizes, all the way up to nine by thirteen feet. This rug can make any outdoor space feel luxurious and sophisticated. This rug has been praised again and again for just how beautiful the designs are. They are simple enough to fit in with any space, but striking enough that they will stand out as a statement piece in your decor. They mimic traditional interior woven rug patterns, making them stand out in outdoor settings. With this beauty, Gertmenian does not allow their quality to slip. Similar to their other rug that placed on this list, this rug is put together with unconditional attention to craftsmanship. This rug will not lose its color, will resist mold, mildew, and staining, and will last through any season. This rug takes the cake as far as price is concerned. Comparatively speaking, their standard size is the priciest on this list. However, if style is your main concern, this is the rug to spring for. If you are looking for a rug to tie together any indoor, outdoor, or all-seasons space, this rug has it made. Any of these designs could bring an element of interest to any space in your home. The designs are classic, the maintenance is low, and the functionality is great. The designs that this rug boasts could complement any design style. A variety of neutral tones can help bring cohesion to your space with ease. Additionally, with a variety of sizing options, you can tailor it to your needs and the needs of your space. Synthetic fibers make this rug a great option for outdoors, indoors, screened in porches, and any high traffic areas within your home. It is easy to clean, just give it a sweep and all the dirt is gone. Additionally, they are easy to roll up and put into storage if necessary. This rug runs in the middle of the pricing range of this list. Because durability and design are working in tandem, the price of the rug is easily worth it. The material that your rug is made from matters a great deal to the overall quality of your rug. Typically, rugs are made from a naturally or synthetically derived source of fiber, which allows the rug to stand up to the elements while outdoors as well as use indoors in areas of high traffic. Natural fibers have seen a surge in popularity in recent years due to their strength, sustainability, their ability to absorb sound, as well as their aesthetics and ability to add texture and depth to a space. Some common natural fibers are hemp, seagrass, jute, and sisal. On the other hand, synthetic fibers can stand up just as well, as well as being available in a wider range of colors. Additionally, they can be rinsed and cleaned easily, as well as having a quick dry time. Synthetic fibers, such as plastic and polypropylene, also tend to be more lightweight than their natural counterparts and cost less to manufacture. What you choose for the material of your rug depends on where exactly you are placing the rug within your outdoor space, how exposed it will be to the elements, and how you want it to look within the space. You must take all of these things into account when you are choosing the best rug for your space, and seeking the advice of the manufacturer or a flooring expert may be beneficial to find the best fit. It is key that you measure the area that you will place your rug in. It is imperative that you measure carefully to ensure that you are going to choose a rug that suits your outdoor area. Outdoor rugs are available in a great variety of shapes and sizes and can be used to break up your outdoor living area into different sections and areas. For example, you can place one rug under your table to designate a dining area and another between a few chairs to define a sitting area. When measuring to place your rug under furniture, remember that you should ideally be placing all legs of the furniture on the rug. At the very least, ensure that the front legs of your furniture is sitting on the rug for the sake of stability. Other than that, the shape and size of your rug is merely personal preference. When you imagine an outdoor rug, you will likely call to mind a bland, taupe rug that is made to stand up to the elements and provide very little aesthetic value to an outdoor space. However, those days are long behind you. Patio rugs are now widely available in bright colors, patterns, and many more styles. When deciding on one for your personal space, be sure to take the space as a whole into consideration; what other patterns and colors exist in this space? Will they add or detract from the pattern of the rug? Will the rug compliment the furniture in the room? Additionally, it is important to consider how much of the rug will be visible. While your space may have another bold pattern that you worry may clash with the rug, if only part of the rug is visible from beneath the furniture, it may add a twist of interest to the space. However, if your rug is standing alone, it may very well clash with the other bold patterns in the space, and it may do you well to consider a less intense pattern alternative. The easiest way to ensure that you do not have to put a lot of effort and time into maintaining your rug is to prevent it from becoming dirty in the first place. When spills inevitably happen, be sure to clean up after them immediately in order to prevent them from staining your rug permanently. This is especially important with rugs made from natural fibers. Additionally, vacuuming your outdoor rug can help prevent dirt from becoming ground deep into the fibers of the rug. You can also prevent damage to the bottom of your rug with regular rounds of sweeping beneath it. If your area is due to experience more extreme weather, be sure to bring your rug inside to prevent damage. Roll it up and put it in storage during these times, or when you know you will not be using it for an extended period of time. While most indoor rugs will not fare well in an outdoor climate, many outdoor rugs can translate well into indoor spaces. When you find a specific pattern, texture, or color in an outdoor rug that you love, you can easily bring it indoors. When moving your outdoor rug indoors, be sure that you are putting down the appropriate type of rug padding to protect your floor (as outdoor rugs tend to have a more durable backing than their indoor counterparts) and to prevent any possibly slipping that may occur. It is also pertinent to be aware that some outdoor rug materials are prone to “shedding,” and do so much more than their indoor opposites. If having a versatile rug is important to you, be sure to pay close attention to manufacturer advice as well as to the materials that your rug is made from. Q: How long will my outdoor rug last? A: The lifespan of your rug depends largely on brand, quality, material, and other differential factors. Additionally, the weather and traffic in the area where it has been placed in your outdoor space can affect its longevity. That being said, even when meticulously or perfectly maintained, even the best rugs stand to need replacement from time to time. By taking into account all of the factors that make your rug unique, you can attempt to anticipate its longevity. However, some manufacturers can potentially provide you with estimates, and some go a step further and give you a warranty on your outdoor rug. Q: What size should I choose for my patio rug? A: There are no guidelines when it comes to choosing the appropriate size rug for your outdoor space. However, a good tactic to get a sense of what size rug you want is to use old sheets to measure out the area that you want the rug to fill. Simply spread your bed sheet to cover the area that you want your rug to cover, take those measurements, and choose the available rug that comes closest to that ideal size. There really are no rules when it comes to this; the size of your rug is up to your personal preference. However, it is recommended that, when placing your patio rug beneath an outdoor dining set, that you leave at least four feet on all sides so that all chairs will remain on the rug when pulled out from the table. Q: Will my rug fade over time? A: Similar to the longevity of your rug, the color of your rug and how long it lasts largely correlates to what your rug is made from and what conditions that it exists within. If your rug endures a lot of direct sunlight, it will likely fade quicker than a rug placed in a shaded area. Additionally, the dye used with your rug also plays a key role in how well the color will hold up. If your rug has been dyed with natural dyes, they will likely not last as long as other synthetic dye options. Typically when manufacturers are creating an outdoor rug, they will opt for a synthetic dye so your rug is less likely to fade, but be sure to check the product descriptions for more in-depth information. Q: Will a rug pad or any type of underlay be necessary for my patio rug? A: Typically with any outdoor rug, an underlay is not required. However, an underlay is usually encouraged by many manufacturers in order to protect the underside of your rug from impact, abrasion, and make it easier to clean. Adding an underlay to your rug can extend the longevity of your rug by years. Not only that, but it can also prevent any potential sliding or slipping by adding grip to the bottom of your rug. Q: I ordered my rug online and it arrived with creasing. Is this a problem? A: This is a common theme when rugs are shipped. When rugs are folded or rolled for an extended period of time, they can develop creasing along the fold lines or a curl from when it was rolled. However, these are not permanent and are likely to disappear within a two-week timeframe. If you notice that your creases are not going away, there could be an underlying structural issue with your rug and it would be wise to contact the manufacturer directly. Q: What is the best way to clean my rug? A: If you spill a substance on your rug, always aim to clean it up as quickly as possible to avoid any potential staining. If you find that a stain has set into your rug, you can reach for your favorite fabric stain remover to start the stain removal process. Never rub at a stain, because this will only force the substance deeper into the fabric. Blotting is the best technique to employ. For a synthetic outdoor rug, reach for a paper towel or a dry cotton towel to blot the stain as thoroughly as possible. If there is any debris leftover from this process, scrape it off with a dull instrument. Then, you can create a solution of a small amount of dish soap and cold water. Using this solution and a sponge, remove the remaining stain and then blot the area dry. For rugs made from natural fibers (hemp, sisal, jute, or seagrass), blot stains with a cloth that is free of any dyes, as these can translate into the natural fibers. When blotting, try to start with the outermost edges of the spill before moving toward the center to avoid any potential spreading. If you are using any cleaning solution, be sure to do a small patch test to be sure that it will not damage your rug. If you are finding it to be difficult to get rid of the stain, employ a professional service. However, avoid dry cleaning, as harsh chemicals can permanently damage your rug. Q: Will vacuuming my rug damage it? A: Vacuuming your rug can actually help to increase the lifespan of your outdoor rug. Rugs in outdoor areas are exposed to much more dirt, dust, sand, soil, and other debris as well as regular foot traffic. Vacuuming an outdoor rug can help to prolong the appearance of your rug while also extending its overall longevity. Vacuuming your rugs is their key line of defense against the buildup of dirt, which can then lead to damage. That being said, there are some parameters in place when vacuuming your rug. In order to avoid any damage to your rug, be sure that you are adjusting the height of your vacuum so that it is in contact with the rug, but not that it slows the motor in any way. Additionally, be sure that the beater bar on your vacuum is in fact rotating when coming into contact with the rug. Additionally, in order to prevent any matting from occurring, be sure that you are vacuuming over your rug in both directions of traffic. While vacuuming will remove most dry particles, other substances may prove to be more stubborn and may require further cleaning. If this accumulation of grime is not taken care of in a reasonable amount of time, it can result in the matting of fibers, which will only further increase the intake of soil and other polluting substances, making your rug appear to be faded and old. As these particles pile up, they can cause dulling and the apparent fading of color. Having your rug cleaned professionally can help to alleviate this dull appearance, but you must also take action with regular vacuuming and the cleaning of any stains as they occur. Being proactive will help your rug stay vibrant longer!